If you have been reading my series about watercolors techniques, you should have a pretty good idea of the variety of ways you can use the medium. I bet you have been thinking that eventually I will run out of techniques to talk about. Well, you are right. Today will be the last article that I post talking specifically about watercolor techniques. That doesn’t mean that there are no other ways to use watercolor. I am sure there are artists out there that use other techniques. The ones I have discussed are most commonly used. You as an artist may come up with ideas and experiment with the medium to create a new innovative technique of your own. (I knew an artist that put his wet watercolor paintings in the freezer to see what would happen when the paint turned to slush.) So don’t think the ones I listed are the only techniques out there. Today I will talk about three more techniques. 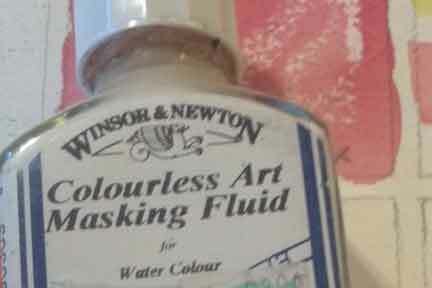 •	Masking Fluid – Masking Fluid is a supply that you purchase at an art supply store. It can be expensive. Some brands are better than others. I do not like to use masking fluid that has a color additive because it can sometimes stain the paper. A brand of masking fluid that I sometimes use. I do not use masking fluid very often. The reason I don’t use it much is because it takes time and seems to be a bother to me. But, I know many artists that use it quite often. 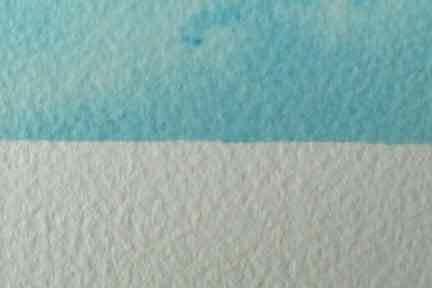 Masking Fluid is used to cover areas of your painting that you want to remain white or light. For instance, let’s say you want to paint some white daisies with a navy blue and dark purple background. You can use the masking fluid to protect the white of the paper where your daisies will be. 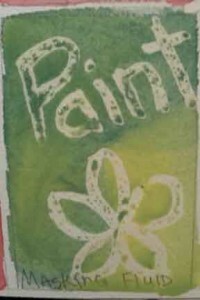 You do this by drawing the flowers and then painting the shape of the flower centers and petals with the masking fluid. 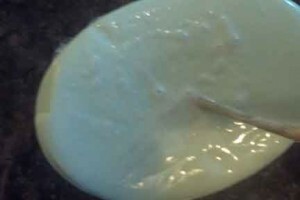 You might even mask out the stems and leaves with the liquid. When the masking fluid is dry, then you can paint the background without worrying about getting any of the paint in the flowers. There are a few tricks to using the masking fluid. First of all, use an old brush because some masking fluid is very difficult to remove from the bristles. I have ruined several brushes over the years with masking fluid. 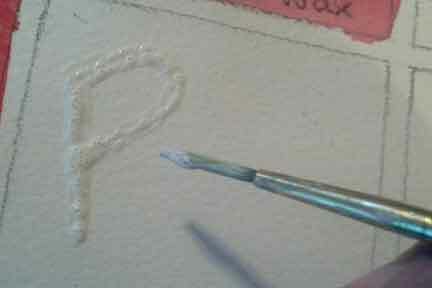 Secondly, rub the brush bristles in soap before dipping in the masking fluid. The soap will make it easier to remove the masking fluid from the brush. Be sure to wash your brush immediately after finishing with the masking fluid. Put soap on brush before the masking fluid. 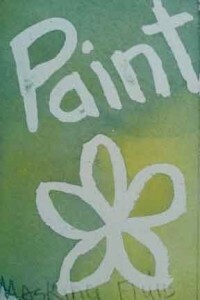 Paint the area you want to remain white with the masking fluid. Let it dry completely. Depending on the weather and humidity in your home it could take a few minutes to maybe thirty minutes to dry. Test with your finger. Once dry, then you can paint over the masked area. Paint with the masking fluid. When the paint is dry you can then rub the masking fluid off. Use your clean fingers or an eraser to rub the mask off. There are erasers that are sold for that purpose but are not a necessity. Once the mask if rubbed off, you can decide if part of the masked area needs to be painted or glazed. For instance, in the example of the daisies, after removing the mask, you may paint the centers a really light yellow and some of the petals a light blue or purple in order to show shadows in the flowers. You would not just leave everything white. Using the mask, made it easier to put in the darks in the background. 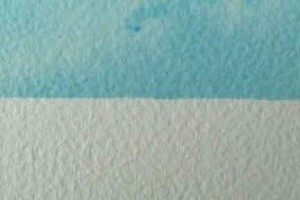 Some artists do not use the masking fluid. They paint around the white areas very carefully. Using masking fluid is not for everyone. You can try it and see what you think. Mask has been rubbed off. 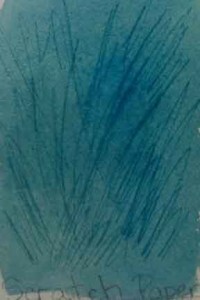 •	Scratching the Paper – Scratching the watercolor paper and then painting over it can create an interesting effect. Each scratch absorbs the paint a little differently. Use a tool to scratch the paper. 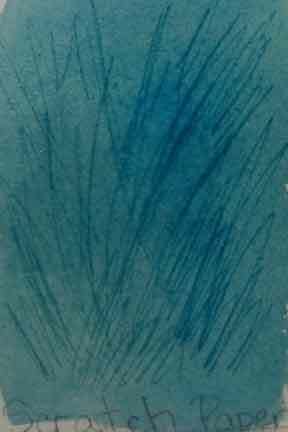 So, if you want to give the appearance of long blades of grass in a field or twigs on a tree you can use a sharp object to scratch the surface of the watercolor paper. Paint over the scratch and the scratch mark will appear darker. Now this is important to remember when you are moving your watercolor paper around. Be careful not to scratch the paper on accident. Those scratches can make darker marks you do not want. 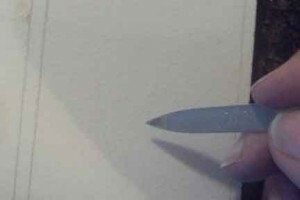 If you want to use this technique, use a knife, a fork, a nail file, your fingernail, a nail, and even the end of your paintbrush to make scratches on the paper. In the picture above, I used a metal fingernail file. I went a little overboard on the scratches just so it would show up better. The scratches could be used to show texture in old wood as well. Play around with this technique and see how you like the ways it can be used. •	Masking Tape – Masking Tape can be placed over watercolor paper to create a nice straight edge. 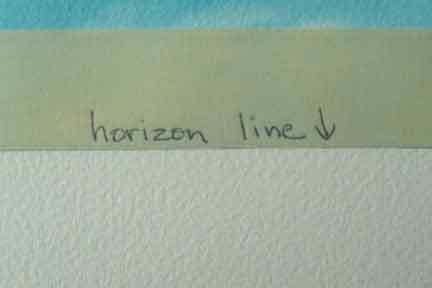 So if you are painting a beach scene, you could put masking tape along the edge where the water and the sky meet. 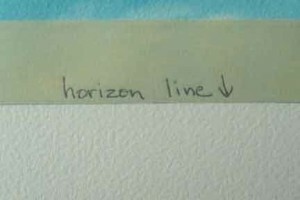 If you place the masking tape below the horizon line, then you can paint in your sky without worries of the sky color getting into water. After the sky dries, remove the tape. Taping off the sky area. Painted sky with masking tape removed. Tape over the sky at horizon line. Then paint in the water. 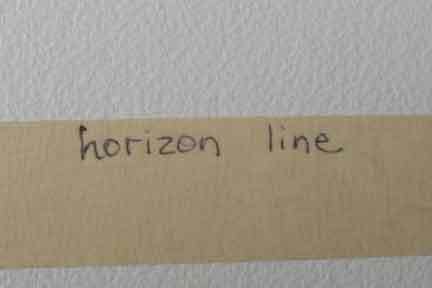 If you are afraid your hand is not steady enough to keep the water from getting into the sky, run masking tape along the horizon line above the water. Paint in the water area. Don’t worry if paint goes over the tape. 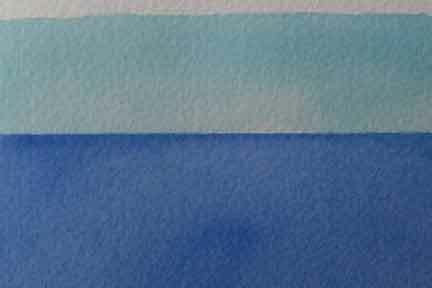 Finished sky and water with very straight horizon line. You can use the masking tape to keep paint out of any area you want to protect like the roof of a building or a wall or fence. Just be sure to take the tape off the paper soon after the paint dries. I have forgotten to remove the tape before and after a week or so, the tape sometimes gets old and will not come off. Do not use old tape. Also, be sure the tape adheres completely. 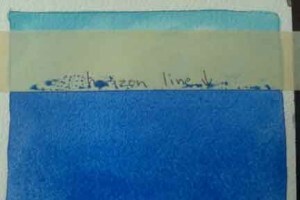 If the tape does not adhere well, the watercolor paint can leak underneath.